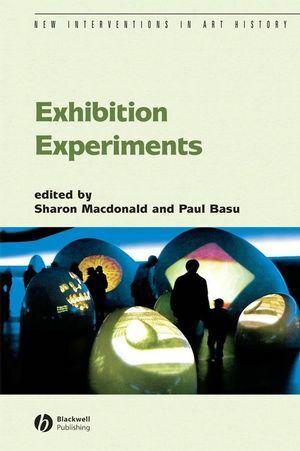 Exhibition Experiments is a lively collection that considers experiments with museological form that challenge our understanding of - and experience with - museums. Sharon Macdonald is Professor of Social Anthropology at the University of Manchester. She is author of Behind the Scenes at the Science Museum (2002), and editor of A Companion to Museum Studies (Blackwell 2006) and Theorizing Museums (with G. Fyfe, Blackwell 1996). Paul Basu is Lecturer in Anthropology at the University of Sussex. An active exhibition experimenter, he is author of Highland Homecomings (2007). 1. Experiments in Exhibition, Ethnography, Art and Science. Paul Basu and Sharon Macdonald. 2. Legibility and Affect: Museums as New Media. 3. The Labrynthine Aesthetic in Contemporary Museum Design. 5. Experimenting with Representation: Iconoclash! and Making Things Public. Peter Weibel and Bruno Latour. 6. Walking on a Story Board, Performing Shared Incompetence. Exhibiting "Science" in the Public Realm. Xperiment! - Bernd Kraeftner, Judith Kroell, and Isabel Warner. 7. From Capital to Enthusiasm: an Exhibitionary Practice. Neil Cummings and Marysia Lewandowska. 8. The Politics of Display. Ann-Sofi Sidén’s WARTE MAL!, Art History and Social Documentary. A seminar with Laura Bear, Clare Carolin, Griselda Pollock and Ann-Sofi Sidén. Edited by Clare Carolin and Cathy Haynes. 9. From Exhibiting to Installing Ethnography: Experiments at the Museum of Anthropology of the University of Coimbra (Portugal) 1999-2005. 10. Raising Specters: Welcoming Hybrid Phantoms at Chicago’s Museum of Science and Industry. 11. Exposing Expo: exhibition entrepreneurship and experimental reflexivity in late modernity.